As I mentioned in a teaser earlier this month, I went shopping for lettering for a new name for my Doctor Who-themed creations in the Gallifrey One 2019 art show. Creating the new logo last week took more time than I had expected due to planning, measuring, gluing and painting. After the bulk of the painting and gluing was done, I went back to beadwork. Still, project pieces were slowed down because they were worked on in between touch-up coats of paint and lettering adjustments. Once the logo pieces were finished, I made a scrabble game out of the letters and posted it on Twitter. Alas, no one guessed the name I had done too good a job of mixing up the letters! The final touch to the logo display was one my husband provided, creating a table riser to lift the lettering slightly above the level of the table so it would stand out better. I keep my client company at my job while he watches t.v. – a lot of it. Luckily this allows me to sit and bead a few hours each day. Because I bead there and at home, my carrying case has gotten more and more portable. I hated this see-through, plastic carrying case at first. I didn’t want everyone to see what I was carting around, but later I grew to love it as I could easily see its contents as I packed it the evenings. In the pursuit of the life of a bead whore, it has become one of my new, best friends. My second best friend is a wooden bead board that divides different colors of beads into organized sections. I was wary of using it at first since I have knocked over a seed bead tray or two. You only do that once, then learn to use cases with lids the rest of your days, believe me! 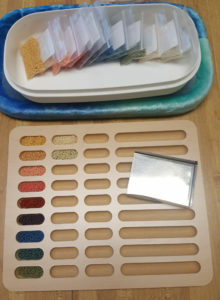 After years of being very careful, I was now tempted to try this new sorting tray I discovered years ago at the Pasadena Bead & Design Show. It was just too cool to pass up, especially after the creator personalized it with a dragonfly on its cover. Still, it sat for a couple of years until I decided to bead the 13th Doctor’s shirt stripe into a lariat scarf. 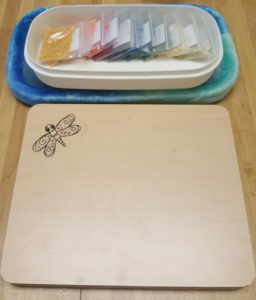 The tray easily holds all 11 colors where I would have needed two of my usual, round plastic cases. Two cases would have been fine except the pattern for 13’s scarf requires I use one bead color at a time. Because of that, I needed all colors open at once, rendering the lidded cases useless. Next time – a preview of our newest beaded designs to premiere in the art show.